DynoTune Product, 712.4-NOS RPM Window Switch with TPS Activation - DynoTune, Nitrous systems, Purge kits, Nitrous Bottle heaters and more! NOS two-stage wide open throttle/rpm-activated window switches are a compact, user-friendly way to eliminate the need for replacing rpm pills every time you want to change the activation rpm of your nitrous kit. They take window switches to the next level, too, eliminating the need for two rpm-activated window switches to control your two stages of nitrous! NOS two-stage wide open throttle/rpm-activated window switches feature two fully programmable independent rpm window switches. They can operate from 0 to 20,000 rpm for anything from a low-rpm engine to a high-revving sport bike, and they are perfect for carbureted or EFI vehicles. Their capability to read a rising or falling throttle position sensor provides accurate activation--every time! A programmable output activates a shift light for on-time, gear-pounding shifts, and the recall feature shows max rpm and TPS voltage for easy setup. 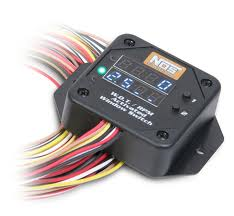 NOS two-stage wide open throttle/rpm-activated window switches have a bright, easy-to-read display and bright LEDs that light up when stages are active for easy activation verification. These versatile switches can be used for nitrous or to activate other accessories. use one output for the nitrous and the other for meth sprayer or shift light etc..